When I announced my intention to visit Southeast Asia, my friends asked me heaps of questions. Which beaches are you staying at? Are you going to Angkor Wat? How long are you staying in Bangkok? While they were all pretty clued up on Thailand, Vietnam and Cambodia, no one mentioned Laos. 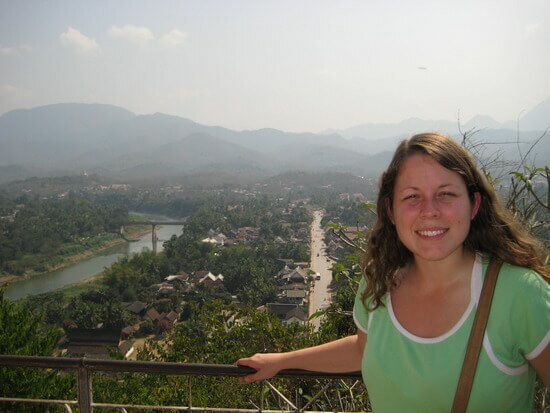 Vang Vieng – where? Wat Phu – what’s that? Yup, poor little Laos was lost in a heady haze of beaches, temples and mountains. None of us really knew much about it and some, myself included, weren’t even sure how to pronounce it (it’s lay-os). It’s a common misconception that because Laos is less famous than its neighbours, there must be a reason, namely that there’s nothing to do, right? Wrong! Sure, it hasn’t got Angkor Wat, but there’s plenty to see in Laos: the picturesque World Heritage city of Luang Prabang, the peaceful karst scenery of the Nam Song River, the elegant colonial buildings of Vientiane and the caves and forests of Nong Khiaw to name just a few. You’ll definitely need longer than you think to pack it all in. At the suggestion of Lonely Planet, I added Luang Prabang to my Laos itinerary without much thought. With a few temples and palaces to see, it sounded okay and I had no prior expectations. But from the moment I arrived, this World Heritage city blew me away. With a gorgeous riverside setting, glittering temples and streets flecked with orange-clad monks, not to mention some excellent eateries and an unspoilt mountain backdrop, Luang Prabang retains a delightful old-fashioned feel and was the highlight of my Laos holiday. I only wish I’d stayed longer. 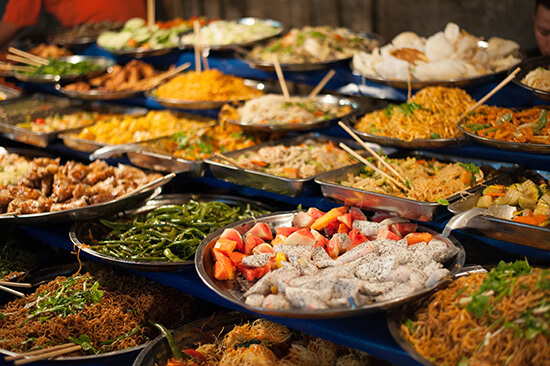 Most people are pretty familiar with Thai food, and you might know a bit about Vietnamese pho and Cambodian amok curries too. But Laos? Well for starters they love sticky rice, which is lucky because I do too. They roll it into a ball, dip it into curry sauces and eat it with their hands, something I can highly recommend you try. Sometimes they flavour it with lemongrass or fish sauce too. Laotians also love their papaya salad, which is made with fine strips of unripe papaya, sugar, garlic, lime and chilli, and packs a real punch. Another favourite is marinated meat, known as larb, which is mixed with chilli and mint and can be served either raw or cooked. And to wash it all down there’s no contest: the delightfully refreshing national beer, Beer Lao, which is on sale absolutely everywhere. Laos is not a place to rush. No one here is in a hurry anyway, so rather than get frustrated as you try to tick off the whole country in three days, it’s best to take your time. Transport between cities takes a while too, whether you’re travelling by bus, car or plane, and the laid-back and relaxed attitude is refreshing. If you’re short on time then my advice is to pick your highlights and stick to them. If not, travel at a leisurely pace and factor in plenty of time for scenery gazing and lazy afternoons bobbing about on the river. 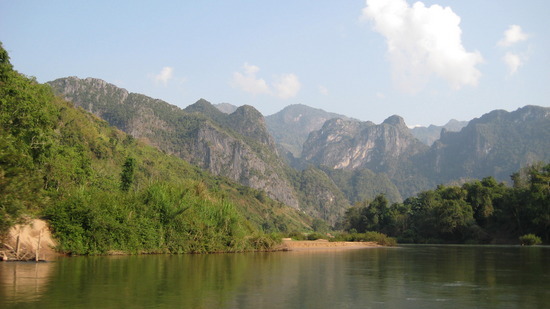 One reason Laos may have popped up on your radar is due to the river tubing craze that swept through Vang Vieng in the late nineties and noughties. Soon, bars were springing up on the Nam Song River and the cocktails flowed freely. But as you can probably guess, rivers and raspberry mojitos don’t mix well and let’s just say things got a little out of hand. Thankfully, a few years ago the authorities clamped down hard on the tubing companies, closed 99% of the bars and peace and tranquillity returned. 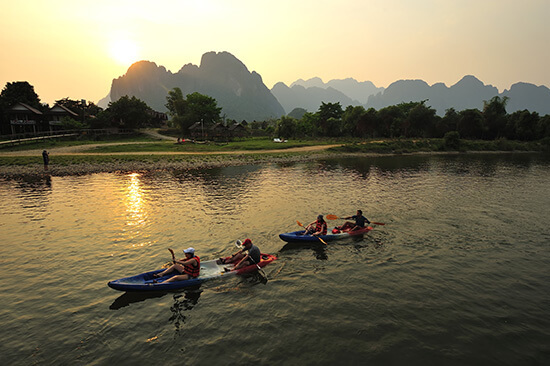 Today, the debauched days are a distant memory and the beautiful karst peaks around Vang Vieng have become the number one spot for outdoor adventures in the country. While river tubing still exists in a very gentle form, most come for rock climbing, kayaking, hiking, mountain biking and caving. Admittedly I knew this before I went because I’d looked at a map, but don’t forget that Laos has no coastline. This doesn’t stop you having beach-related fun though, as in the south of the country, Si Phan Don, meaning Four Thousand Islands, is a cluster of islets in the Mekong River. 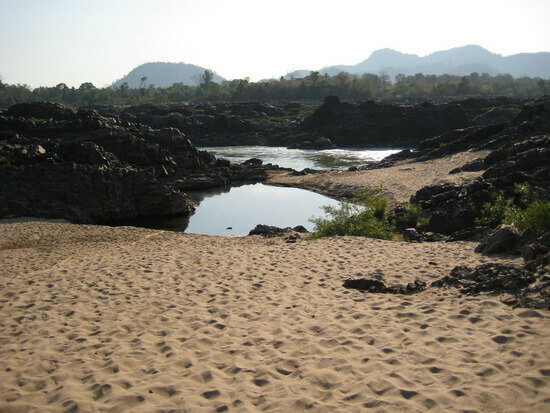 Here, not only is the scenery stupendous and the pace relaxed, but you can find plenty of soft sandy beaches on the riverbanks. The best way to explore is by kayak, taking your bathing costume and stopping off at the various swimming holes as you go. Quelle surprise! People speak French in Laos. Well it’s actually not that much of a surprise when you consider the French explorers who arrived in the 19th century, bringing their language with them. It’s not just the language where you’ll see a French influence though. You might spot crêpes on the breakfast menu, French=style colonial buildings, and you’ll definitely notice the wafts of freshly baking baguettes rippling through the streets. Take my advice and don’t leave Laos without sampling at least one bakery – the café au lait and pain au chocolate are enough to rival any of those in Paris. Bon appetit! 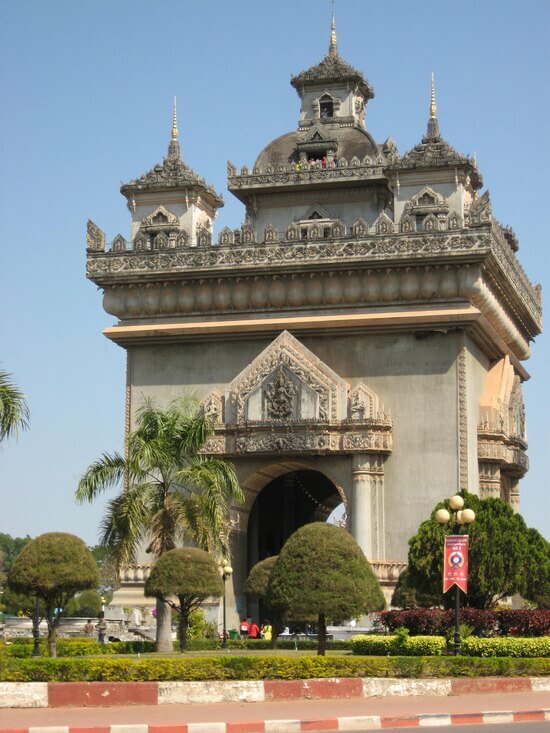 Who can name Laos’ capital? Well you, now. 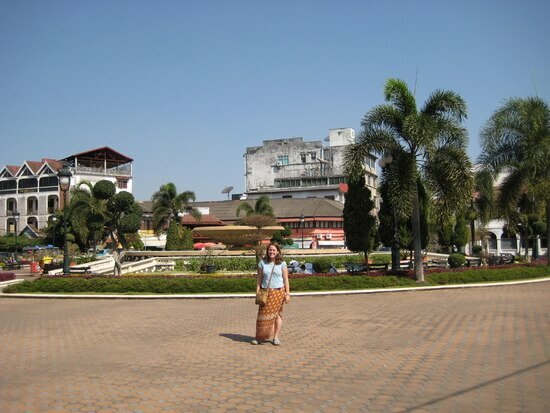 It’s Vientiane. More of a town than a city, Vientiane is mostly used as a transport hub, but I decided to stay for a couple of days, and I’m very glad I did. It’s an attractive, laid-back city, its roads lined with colourful flower beds, its buildings distinctively European in places. Attractions include the Lao National Museum and the Patuxai Victory Gate, which might remind you of France’s Arc de Triomphe. Day trips to fishing villages and the quirky statues of Buddha Park are possible, and you’ll find a number of wonderful French bakeries filled with pastries and treats to tempt you. A couple of days? I should have stayed a week! If you love Laos as much as we do, take a look at Flight Centre's tailor-made Landscapes of Laos holiday or make an appointment to speak to one of our Travel Experts today.